Islam Around Us: Suicide attack on Pakistani church kills 75. 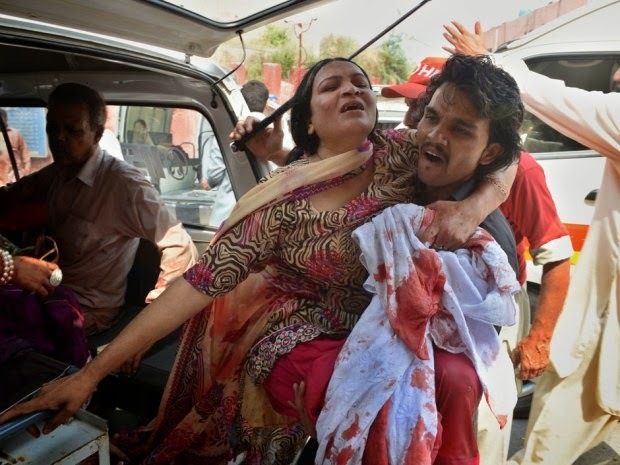 PESHAWAR | Pakistan | 22 Sep 2013 :: A pair of suicide bombers detonated their explosives outside a historic church in northwestern Pakistan on Sunday, killing 75 people in the deadliest-ever attack on the country’s Christian minority, officials said. The latest drone strike came Sunday, when missiles hit a pair of compounds in the North Waziristan tribal area, killing six suspected militants, Pakistani intelligence officials said. The attack on the All Saints Church, which also wounded 110 people, underlines the threat posed by the Pakistani Taliban at a time when the government is seeking a peace deal with the militants. It will likely intensify criticism from those who believe that negotiating peace with the Taliban is a mistake.